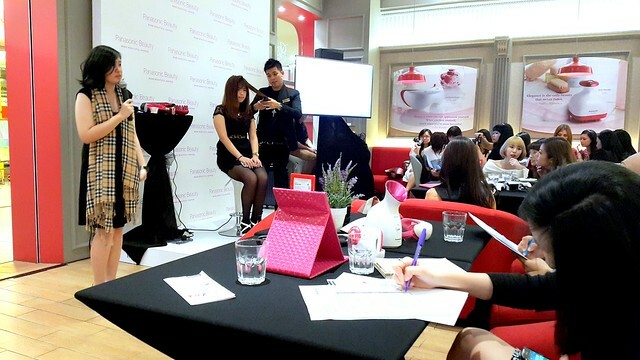 Attended Panasonic Beauty Cafe at Betjeman & Barton, One Utama last Thursday with other beauty bloggers. 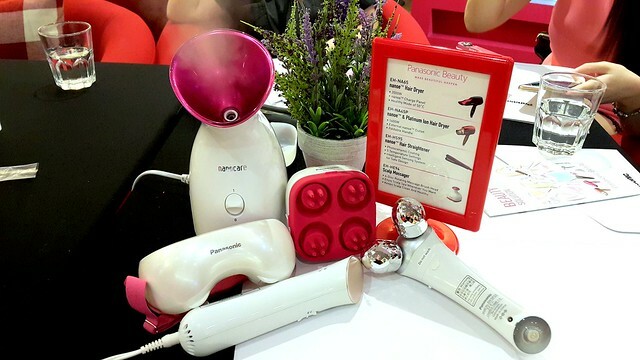 It was my first time attending a beauty cafe and was a great experience as Panasonic Beauty provides real life demonstrations of their newly innovative and amazing hair and face products. 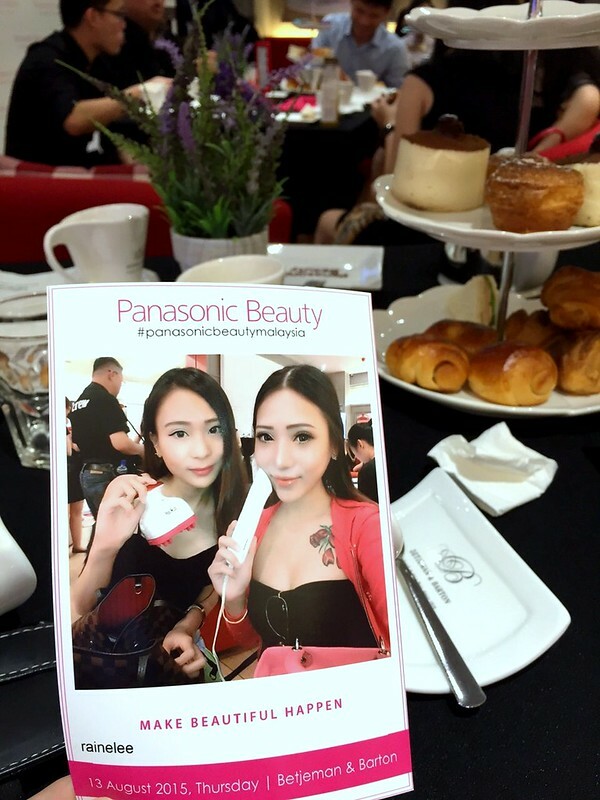 Thanks to Panasonic, I had hands-on experience with Panasonic Beauty products along with professional advice and tips on how to look good by VIP speakers - Yves Chong, director of Number 76 Hair Salon & Aishah Sinclair, Panasonic Beauty Brand Personality & Radio announcer. 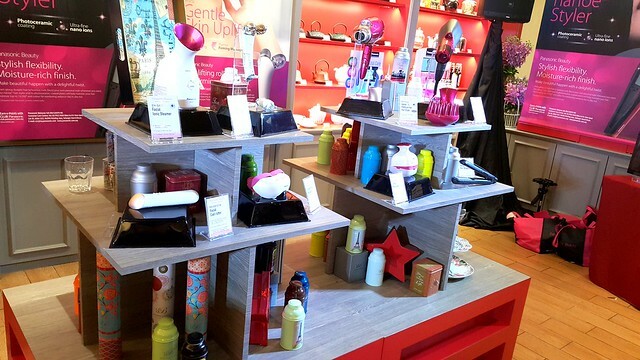 Panasonic Beauty products are very unique in their own way. Instead of going to the salon every month for high maintenance beauty care, Panasonic Beauty products allows us to have our own low-to-no maintenance beauty routine at home. How amazing is that!! I love how Panasonic hair dryer comes with the nanoe™ technology - producing nano-sized electrostatic atomized water particles! 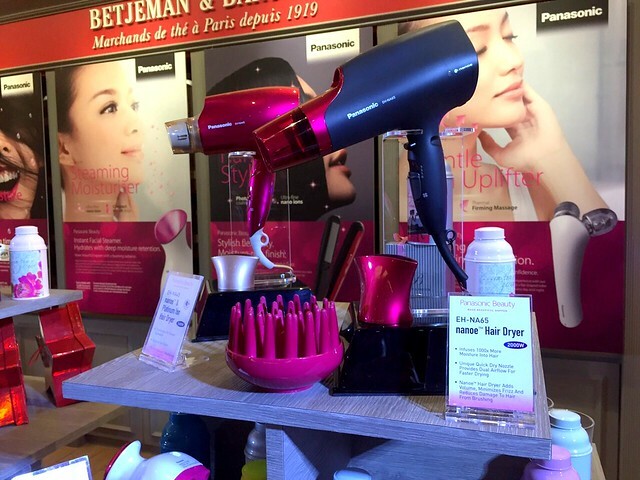 This hair dryer doesn't dehydrate the hair yet deliver moisture and soothe the hair. 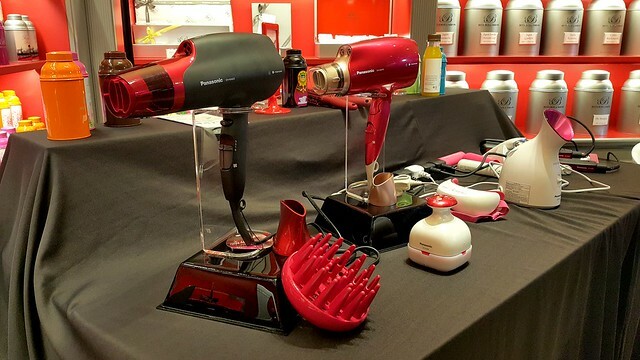 No need to worry about hair getting damaged while blow drying the hair daily. 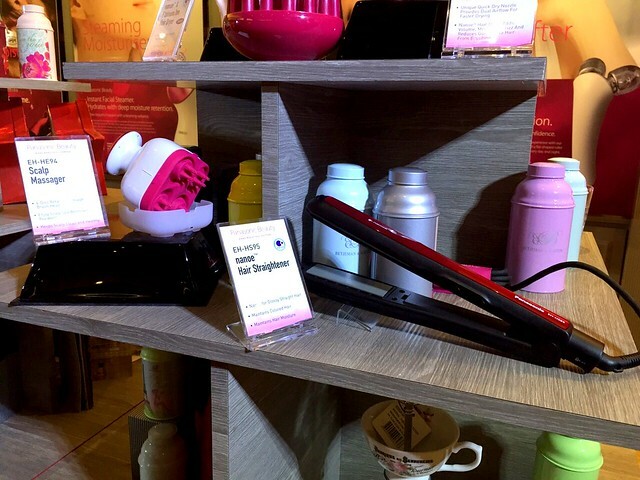 This scalp massager is one of my favourite beauty product. Not only you can massage on your scalp but also on your shoulders. The best part of this scalp massager is WATERPROOF. I always have a hard time washing my hair because my nails are manicured all the time but with this product, I can enjoy washing my hair without destroying my pretty nails!! This hair straightener also comes with nanoe™ technology. It maintains hair moisture and allows everyone to straighten their hair daily without getting damaged. This product has photo ceramic coating which protects colored hair and prevent it from fading. I tried straightening my hair over and over again with this product and it doesn't leave my hair ends dry and frizzy. People with dry and sensitive skin like me will love this steamer! The Facial Ionic Steamer releases ultra-fine, nano-sized ionic steam that penetrates the epidermis and hydrate the skin effectively. In just a few minutes, the ionic steam will open up the pores and provides deep cleansing to the skin. Works in removes makeup, dirt and oil gently without being to rough to the skin. Warm facial and body massage at the same time soothe the skin. Two different ways to achieve bouncier, smoother, firmer and brighter skin - stroking roller and squeezing roller. The detachable flat-shape roller works by stroking the skin upwards gently whereas the oval-shape rollers squeeze and lift up for a firmer skin. Helps to keep delicate eyes healthy as it massages around the eyes area to improve blood circulation. A great way to help relax the eyes especially after a staring at the computer or phone screen for too long. It works to get rid of dark eye circles and eye bags too! This Facial Cool Putter tighten pores and cool down the skin. Suitable to use after deep cleansing skin with the Facial Ionic Steamer. I love the cooling sensation of this product. So refreshing and it calms my sensitive skin. 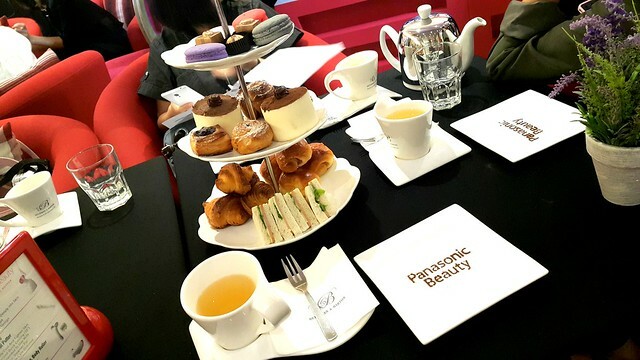 After trying out all the amazing products, we were generously served with a set of tea time tier and free flow of french tasting tea. Courtesy of Betjeman & Barton. I'm a happy girl when it comes to desserts. Yumms. Best steam flat iron straightened I have ever purchased. Even the box is high quality! It includes a convenient travel bag and glove if you are prone to burns. The steam factor is awesome. It even includes a dropper to add water. I am able to straighten or curl my hair with no dry damaged ends; it is very sturdy and well made. I love it!! A two times-weekly steaming might also assist you resolve blackheads and zits like no other technique can. It can lessen pores and skin inflammation and extremely hydrate your face. Just believe in case you blended steaming with blue mild therapy! Let's take a closer examine the pinnacle five facial steamers to look which one can be the exceptional for you.